Due to the fundamental two-way interaction between the theoretical and the empirical aspects of monetary economics, together with the relationship of both to matters of public policy, any organization of material comprehensively spanning the subject is bound to be arbitrary. The 23 surveys commissioned for this Handbook have been arranged in a way that the editors feel reflects some of the most important logical divisions within the field and together they present a comprehensive account of the current state of the art. The Handbook is an indispensable reference work which should be part of every professional collection, and which makes ideal supplementary reading for graduate economics students on advanced courses. Introduction (B.M. 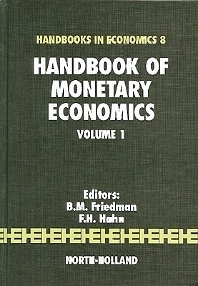 Friedman, F.H. Hahn). Money in the Walrasian Economy. The transactions role of money (J.M. Ostroy, R.M. Starr). Liquidity (F.H. Hahn). Money in general equilibrium theory (D. Duffie). Money in Non-Walrasian Settings. Non-Walrasian equilibrium, money and macroeconomics (J.-P. Benassy). The game theoretic approach to the theory of money and financial institutions (M. Shubik). Money in Dynamic Systems. Money, inflation and growth (A. Orphanides, R. Solow). Overlapping generations models with money and transactions costs (W.A. Brock). Money Demand and Money Supply. The demand for money (S. Goldfeld, D.E. Sichel). Money supply (K. Brunner, A.H. Meltzer). The supply of money and the control of nominal income (L. Papademos, F. Modigliani). Pricing Non-Money Assets. Capital market theory and the pricing of financial securities (R.C. Merton). Specification and estimation of intertemporal asset pricing models (K.J. Singleton). The term structure of interest rates (R.J. Shiller, J.H. McCulloch).